Dazzling Debuts"—WYPR, "The Weekly Reader"
Breaking Bad meets No Country for Old Men... Ever since their father's untimely death five years before, Wyatt Smith and his inseparably close twin sister, Lucy, have scraped by alone on their family's isolated ranch in Box Elder County, Utah. That is until one morning when, just after spotting one of their steers lying dead in the field, Wyatt is hit in the arm by a hail of gunfire that takes four more cattle with it. The shooter: a fever-eyed, fearsome girl-child with a TEC-9 in her left hand and a worn shotgun in her right. They hold the girl captive, but she breaks loose overnight and heads south into the desert. With the dawning realization that the loss of cattle will mean the certain loss of the ranch, Wyatt feels he has no choice but to go after her and somehow find restitution for what's been lost. Wyatt's decision sets him on an epic twelve-day odyssey through a nightmarish underworld he only half understands; a world that pitches him not only against the primordial ways of men and the beautiful yet brutally unforgiving landscape, but also against himself. As he winds his way down from the mountains of Box Elder to the mesas of Monument Valley and back, Wyatt is forced to look for the first time at who he is and what he’s capable of, and how those hard truths set him irrevocably apart from the one person he’s ever really known and loved. Steeped in a mythic, wildly alive language of its own, and gripping from the first gunshot to the last, Rough Animals is a tour de force from a powerful new voice. 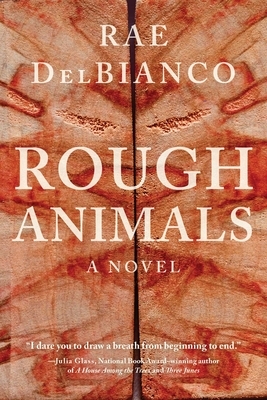 Rae DelBianco was raised in Bucks County, Pennsylvania, where she wrote and raised livestock from a young age. She attended Duke University as a Robertson Scholar and was later accepted to Curtis Brown's six-month novel writing course in London. "Enrapturing . . . A brutal but beautifully written Western. "—vulture.com, "8 New Books You Should Read This June"
"The tension doesn’t let up. . . . If the narrative keeps you turning the pages, her almost Biblical voice makes you want to stay and dwell on each sentence. "—Outside, "What We Read, Watched, and Listened to in May"
"[A] dazzling debut. "—WYPR, "The Weekly Reader"
Rough Animals is not only a wild, unnerving story, but a heart-hammering experience. . . . If you like The Godfather, The Patriot, or any other epics full of revenge, familial bonds, and brutal bloodshed, you're sure to enjoy Rough Animals."